Esthetician, hair dresser, bartender, apprentice, Carpenter, construction supervisor, head foreman, safety officer, estimator, project manager, construction company owner – 39-year-old Karma Hunter has come a long way in 21 years. She’d never really considered a career in construction until one day in 2005. 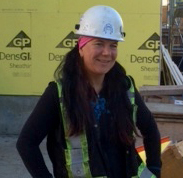 While on the LRT* going to work, she saw a sign for Women Building Futures – an Edmonton-based program that trains women to enter the construction trades. A single mom at the time, Karma was bartending, but working nights meant she didn't see her son during the day. So, “you know what,” she said to herself, “I’m going to do that.” And four months later she did. Today she owns Cree-Con Construction with her husband, Dennis. 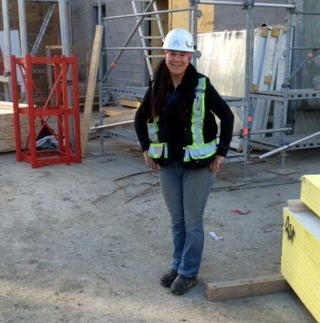 Specializing in concrete, their company works for all the big construction companies and places concrete for a majority of the high rises in Edmonton, she says. This summer, they’ll have 24 employees. But Karma will be the first to tell you, it was an uphill battle. “My first 3½ years were super hard,” she says. And although she faced challenges along the way, she wasn’t turned off. During the first six months, it was hard to fit in, she says. No one is sure how to act or how to be around a girl in the trades because construction has typically been a male-dominated workplace. But the industry is learning and the workforce is starting to become more diverse. She then started venturing into other things. “It’s very hard to do stairs, so I got really good at concrete stairs,” she says. She also learned how to layout buildings and became foreman for layout on high rises the company was working on. She even got to work on small, special projects at the West Edmonton Mall, where she had three guys working under her. “So wherever I was, I found a niche to be really good at,” she says. And that helped to propel her career. She moved up to supervisor within two years. But then misfortune struck with a bad car accident, and despite her lawyer advising against it, she went back to being a carpenter “because I didn’t want to leave the trades,” she says. “I loved it so much.” The physical demands, however, were now too much. So she joined her husband where he worked and became the company safety officer, estimator and project manager. Two years later, they started their own concrete company. There are a lot of woman who really want to be in the trades and who are willing to earn their way and earn the respect of their male co-workers, she says. In 2015, Karma was awarded Female Executive of the Year and her company awarded Fastest Growing Company of the Year by The Stevie Awards for Women in Business. "If you’re going to work that hard and have to prove yourself, be passionate about whatever career you choose." "I didn’t come in there thinking that I deserved everyone’s respect. I knew I had to earn it." "If you’re going to go through it all to get there, you should really want it. Because then you feel so rewarded at the end of it."